Living a life of sufficiency is tough when you have children: they want stuff, attention and what their peers have got. Here are a few suggested places for almost free days out. Norman’s Bay – this is a pebble beach between Pevensey Bay and Cooden beach at Bexhill. 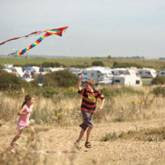 It is never busy and is good for tiring the kids out with a long walk; it is also usually good for kite flying. The best thing about it, though, is there are no shops. Once the children know that, they realise that their pester-power is worthless and they just get on with having fun. Fairlight – east of Hastings, the coast here has boulders fallen from the cliff at Pett Level and huge imported rocks to form sea defences at Fairlight Cove. These are great for clambering over and there are fossil hunting and rock-pooling opportunities. Again, there are no shops but be aware that Fairlight Cove does have a tradition of naturism. Ashdown Forest – home to the original Hundred Acre Wood. Plenty of free parking and you can wander for miles. Take an old white sheet, spread it under a tree and give the branches a shake. Investigating what falls out will keep the kids busy. No shops but usually a few ice cream vans. Towner Art Gallery – next to the Congress Theatre in Eastbourne, the big gallery spaces are very exciting for young kids; best of all is the Art Box room upstairs where children can draw, paint, shape and stick depending on the theme for that day. Saturday morning pictures – not strictly free, but Cineworld at Sovereign Harbour, Eastbourne shows mostly major feature-length animated films a couple of months after release for £1. Adults and kids pay the same and there is usually a choice of three films. As long as you take your own snacks, it’s a cheap morning out. De La Warr Pavilion – the dominance of installation art here makes this an interesting place for kids. Mine loved Anthony Gormley’s Critical Mass of 60 life-size sculptures, especially imitating the poses for photos; but they got into trouble for trying to rummage through Tamoko Takahashi’s collection of skip-found, everyday objects.